The fire at Belt Transfer destroyed the nearly century old building along East Main Street. 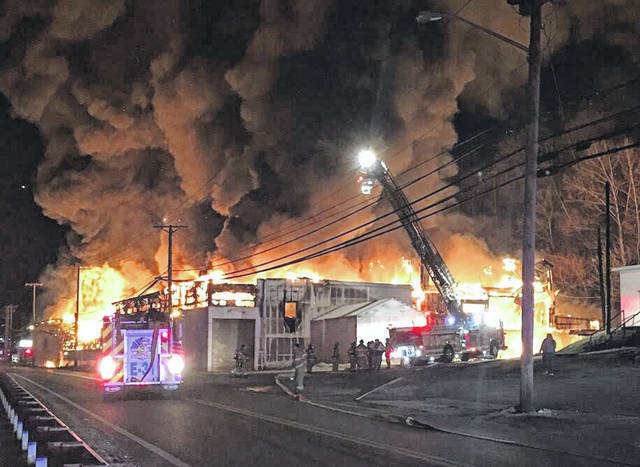 POMEROY — The cause of the large fire which destroyed a commercial building in Pomeroy last weekend is “undetermined”, according to the State Fire Marshal’s Office. “The cause of the fire is going to be ruled undetermined due to the severity of the damage,” stated Fire Marshal’s Office Public Information Officer Brian Bohnert in an email on Monday. As previously reported, firefighters from Pomeroy, Rutland, Middleport, Syracuse and Mason volunteer fire departments were called to the former Midwest Steel/Mountaineer Metals building at 11:15 p.m. on Saturday, March 16 for a working fire at the building. The building was being used by Belt Transfer at the time of the fire. Around 70 firefighters from the 5 stations responded to bring the fire under control. Crews were on scene for about five hours before clearing the scene from the initial call. Pomeroy Firefighters were called back later in the day for hot spots and smoldering pockets of fire in the building. Fire crews were able to contain the fire to the one building, without spreading to nearby buildings including a business office on one side and an older brick building on the other. The State Fire Marshal’s Office was called in to handle the investigation into the cause of the fire.